If you traded long the U.S. Dollar or shorted another currency based on our January post or our more recent update in May, it’s time to pay attention to upcoming resistance levels in the Dollar Index and the associated ETF (NYSE Arca: UUP). Depending on your trading time frame, you might even consider taking some profits soon. 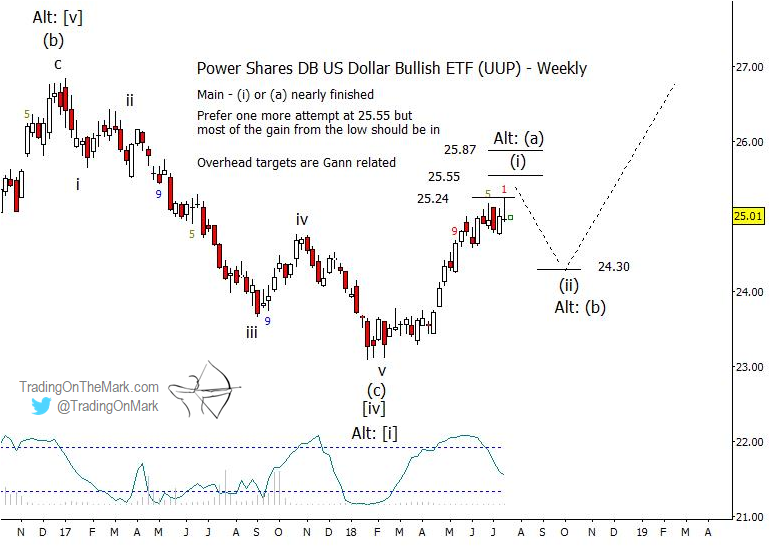 We still believe the Power Shares DB U.S. Dollar Bullish ETF is, well, bullish. The larger upward move should travel considerably farther. However the first leg of that move may be approaching an end. We recently posted a big-picture chart on Twitter showing our main Elliott wave scenario for UUP — an upward path persisting into 2019 and maybe longer. (Follow us on Twitter for more charts like that.) We have drawn the move as impulsive, but a three-wave pattern would be possible as an alternate scenario. Meanwhile on a weekly chart we can see the developing structure of the first upward leg — wave (i) or (a) of the bigger move. On this smaller scale the first leg appears impulsive, and it might now be working on the final, even smaller fifth wave of the leg. Using Gann-related methods, important resistance areas to watch are near 25.24, 25.55, and 25.87. The small impulsive structure would look more “complete” if price were to move a bit higher to test the middle resistance area, but the minimum requirements for the upward leg are already in place. If a retrace kicks in, traders might watch the area near 24.30 which represents a Gann level that was broken as resistance. It could become a support. We will be able to make more precise estimates of downward targets after the turn is confirmed. Charting the Dollar is extremely helpful when trading paired currencies because it gives the trader an additional reference frame for identifying the patterns and the turns. At our website we track the Dollar Index and the Euro as well as other markets on a daily basis, and we also cover the Yen and the British Pound when we think important moves are nearby.